Contrarily to what old PC behavior inculcates, insults have their, irreplaceable, use. An immense occasion was missed, before World War Two. The war could have been avoided by properly insulting (and threatening) the Germans and Japanese leaders and threatening them with annihilation. In the case of the Germans, it is certain that it would have avoided the war (as I have explained many times with excruciating details). And remember that the Japanese were following the Nazis and Italian fascists. By insulting the leaders, the populations would have realized they were going down the abyss. In 1942, Professor Frederick Lindemann (later Lord Cherwell) was appointed the British government’s leading scientific adviser (with a seat in the Cabinet) by his friend, the very scientifically minded Prime Minister Winston Churchill. Lindemann presented a paper to the Cabinet advocating the area bombing of German cities. That was accepted by Cabinet and Air Marshall Harris was directed to carry out the task (Area bombing directive). It became a crucial part of the total war against Germany, as it deprived the country of fuel, and forced the Nazis to mobilize 30% as much soldiers in ground air defense as they had, fighting in the USSR. 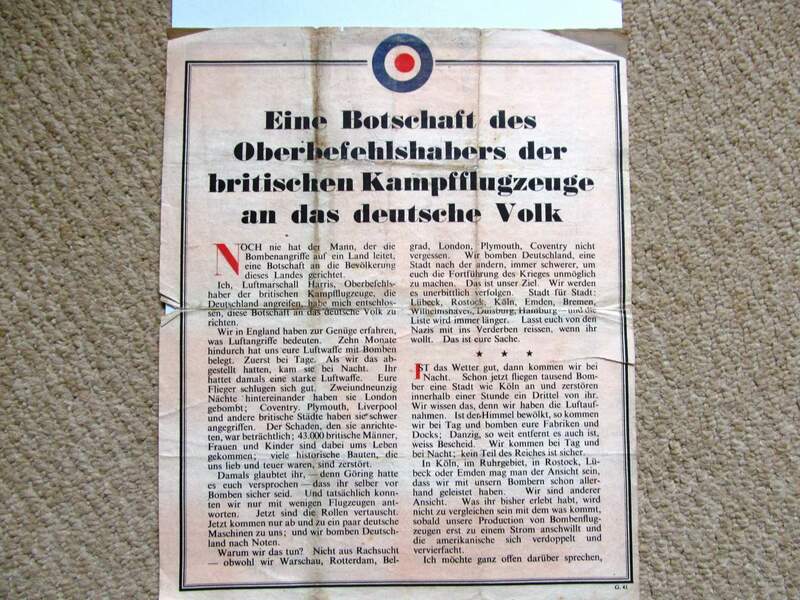 Harris, head of the British bomber command dropped a leaflet on Nazi Germany in 1942. Important notions are absent; the mass massacre, the holocaust, of civilians, in particular Poles and Jews (something that was well-known by 1942). An occasion was missed to tell the Germans that their crimes would not be forgiven, until they threw the Nazis out and capitulated to the United Nations. It would have stiffen the spines of German generals who thought the Nazis were nuts. Why are we doing so? It is not revenge — though we do not forget Warsaw, Belgrade, Rotterdam, London, Plymouth and Coventry. We are bombing Germany, city by city, and even more terribly, in order to make it impossible for you to go on with the war. That is our object. We shall pursue it remorselessly. City by city; Liibeck, Rostock, Cologne, Emden, Bremen; Wilhelmshaven, Duisburg, Hamburg — and the list will grow longer and longer. Let the Nazis drag you down to disaster with them if you will. That is for you to decide.It is true that your defenses inflict losses on our bombers. Your leaders try to comfort you by telling you that our losses are so heavy that we shall not be able to go on bombing you very much longer. Whoever believes that will be bitterly disappointed. So what happened? 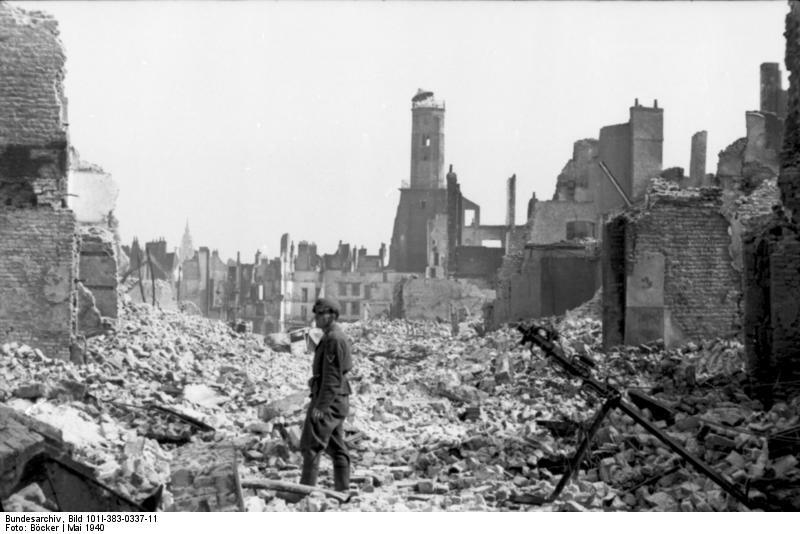 By 1943, the Germans were widely talking about the fact that the holocaust of the Jews had brought the calamity of aerial bombing of German cities, that it was deserved, in a sense. Later, encouraged by a Nazi crack-down, the feeling passed, and the Germans fought to the bitter end. “Read this carefully as it may save your life or the life of a relative or a friend. In the next few days, some or all of the cities named on the reverse side will be destroyed by American bombs. These cities contain military installations and workshops or factories, which produce military goods. We are determined to destroy all of the tools of the military clique that they are using to prolong this useless war. Unfortunately, bombs have no eyes. So, in accordance with America’s well-known humanitarian policies, the American Air Force, which does not wish to injure innocent people, now gives you warning to evacuate the cities named and save your lives. America is not fighting the Japanese people but is fighting the military clique, which has enslaved the Japanese people. The peace, which America will bring, will free the people from the oppression of the Japanese military clique and mean the emergence of a new and better Japan. You can restore peace by demanding new and better leaders who will end the War. To dare say that the fascist leaders which brought World War Two were crazy was way too polite, and it was done way too late. True enough, thus rough enough propaganda could have done much more in World War Two. It could have prevented the entire world war and its holocausts. But of course the Anglo-Saxons would have had to want to prevent the disaster in a timely manner. They didn’t. Or, at least, their leaders didn’t want to. As simple as that. But, if the measly JFK files can’t be all released, one should not expect to examine what really happened with fascism before World War Two. Why Did Germany Lose World War Two? Because the nasty don’t deserve anything else, of course. But there is much more to say, bearing on the astounding way all too many Germans, starting with their crippled, not to say creepy, finance minister find normal to treat part of Europe, even today. Salvador Dali pointed out that Germany launched World War Two, just to lose it. The same German sadomasochism is fully obvious with all Germans who proposed to throw Greece out of the Eurozone. Indeed, violent ones, explain to me what to do next with the Greeks? Use German high tech to displace Greece east of New Zealand? After winning his referendum on the NO (“oxi”) to Greece’s creditors, Tsipras operated close to a 160 degree turn. But it makes sense. Now Tsipras has popular support, and he requests help for three years (rather than three months). Greece should be given all what he wants. Enough of starving Europe with lack of money, just as European were starved of food in Nazi extermination camps. Saving Greece now depends upon defeating (whatever remains of) the fascist mood in Germany. So it’s timely for little recaps on recent German exploits. How did Germany end up killing more than 800,000 Greeks, a little while back? Starting in 1792, and ending apocalyptically in 1945, the obsession of German speaking plutocrats was to destroy the French Republic. In the process, Jewish European and Prussia got annihilated. The correct lessons of how Germany got crazy in the Twentieth Century have not all been drawn. Reading Nietzsche helps, as he forecast in a general fashion what happened next, including with the Jews, although it turned out perhaps even worse than he expected. The French Republic nearly annihilated the Prussian plutocracy in the first week of September 1914, in a bold counterattack, east of Paris. After that, the, entrenched, frontlines did not move for four years. In 1919, at the Versailles Peace conference, the French Republic tried to make sure Germany could not try the same sort of attack again, as easily. In vain: Great Britain and the USA had interest to keep the French Republic down, and Germany was the best way to insure that. France was left to face German fascism alone. Germany refused to repair its deliberate destruction in France and Belgium, and soon turned to a maniac to help getting even more crazy. Ever since 1792, the greatest enemy of plutocracy is not plutocracy, German or not, but the French Revolution. In 1815, at Waterloo, France was partly dismembered, losing parts of Gaul (otherwise France would be a 100 million superpower now; instead a French pilot from Airbus had to content himself today with traversing the channel in an electric plane; Airbus plans hybrid electric jetliners soon). Besides the necessity to keep the French Revolution down, Germany could be made into a plutocratic province of Anglo-Saxon plutocracy… As it was. Such facts put plutocracy in a bad light, and are certainly not official historical analysis. French leaders expected Germany to try to destroy the French Republic again within 20 years. As happened. This is a short compendium of well-known reasons. It is entirely correct, yet entirely silly. Its main argument is that Germany did not have the economic capability to take on the UK, the USA, and the USSR. Yes, true: but how did it get to that? In, say, 1935, 1936, Nazi Germany was de facto, or formally allied to Great Britain (with a formal treaty in 1935), the USA (massive investor and even monopolist in the Dritte Reich), and the USSR (the secret alliance between Germany and the Bolsheviks, dating from 1916 was made official in 1939). The other two reasons given are second, or third order (not false, but secondary, consequential to much more important reasons). 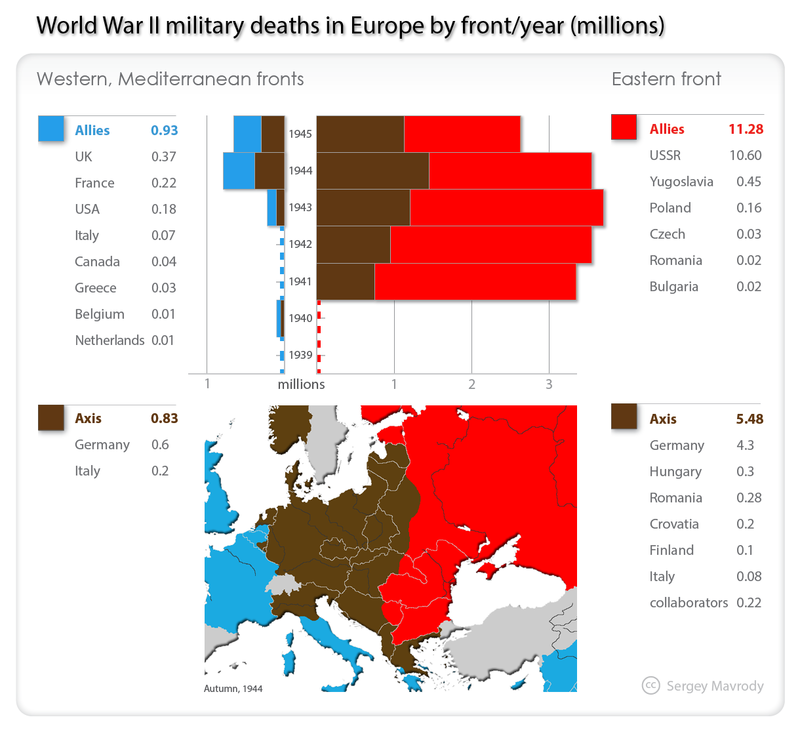 Where to start in exposing why Germany lost World War Two? First of all because Germany was perverted by an abominable mentality. Nazi Germany lost the so-called Second World War because the French Republic declared war to Hitler on September 3, 1939, while dragging Great Britain into the conflict. It required guts on the part of the French. When the French Republic declared war, Hitler was allied to Stalin, Mussolini, the Japanese fascists, and not least, a giant panoply of plutocrats from the USA who made sure Congress did as they wanted. American plutocrats provided the Nazi dictator with an entire economy, not just enough weapons to kill an estimated 10,000 opponents in 1932. American plutocrats provided Hitler with advanced secret technology, such as how to make synthetic oil (Exxon, then under another name) and computers (IBM: did not change names, just covered up the story), and near infinite financing: Prescott Bush, grandfather of W. Bush managed the most important Nazi war industry, American Silesian. And so on. Books on all of this are given the very cold shoulder by (plutocratically financed) universities of the USA. Hitler had no oil, at all. But Texas, and, in particular, Texaco, had plenty, and so did the USSR. They sold it to Hitler. Without American plutocratic corporations input, Hitler could not have driven one single mile inside France. Nazi computers? The IBM corporation of the USA had been given the monopoly of computing inside the Reich. The vaunted Nazi organization was all managed from New York (starting in 1942, after Hitler had declared war to the USA, said detailed management went on, but passed through Geneva). The French knew all of this. They could see Hitler had constituted ten armored (“Panzer”) divisions (the French had seven armored division, and three super heavy, unstoppable armored divisions). 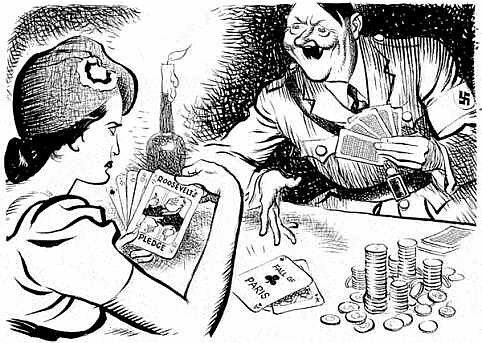 By declaring war on September 3, 1939, France short-circuited all of Hitler’s strategy. By the time Hitler attacked the USSR, the campaigns against Poland, France and Crete, and the defeat suffered in Norway at the hands of the French Foreign Legion, had cost Hitler the death, or “disappearance” of no less than 150,000 of his most fanatical soldiers, and the Wehrmacht was actually less powerful than when it attacked France. Not only this, but because the Nazis were forced to mass produce existing equipment, they could not develop, and mass produce, new weapons. By the Battle Of Brody (June 1941), the Germans discovered that the new Soviet T34 tank was nearly as impervious to their weapons, as heavy French tanks had proven, a year earlier (one heavy French tank had taken 400 hits before being destroyed). And so on. The Brits broke German codes very often, all too often. For example, British intelligence was even able to warn the USSR about the detailed Nazi attack plan at Kursk in 1943. Kursk was the last ditch Nazi effort: failing it meant failing the war in the East; it failed, because the Soviets mysteriously anticipated all German moves. Thus the greatest tank battle ever was lost, and after that the Nazi empire was just a fat, obese, soft belly facing Stalin’s 600 divisions. Stalin counter-attacked at Moscow in December 1941 because his spy Jorge, and others, who had told him in advance that Japan would attack the USA (instead of attacking the USSR). That allowed Stalin to put the entire Siberian Army on trains, and bring it to the front around Moscow. A year later, a year after France (and Britain) declared war, the war was lost. Just like Napoleon, and for the exact same reason, Hitler could not cross the channel: the First French army, making a circle of steel and fire, had allowed the entire British army to escape at Dunkirk. Hitler had to secretly prepare to attack his Soviet ally. As he explained to 10,000 Nazi Generals, there was no choice: Britain could not be defeated. The Nazis had to crush the USSR before Stalin understood that. An attack was planned in mid-Spring 1941, to make sure Moscow would fall before the following winter. However his ally Mussolini had a mind of his own. After being severely defeated by the French in June 1940, he was anxious for revenge, and virile behavior worthy of his alleged ancestors. The Italian buffoon gave an ultimatum to Greece, invaded, and was promptly defeated by the Greeks. That was a serious problem: with an hostile, British (and Free French) allied Yugoslavia and Greece to the south, Hitler was in danger of a British (and French) counterattack to the south. So Hitler attacked Yugoslavia and Greece. while the British rushed to the rescue. The Nazis could not swim tio Crete, so they flew all their paratroops. They won, after severe losses. In the end, the attack of Russia was differed by six weeks. And it’s a significantly diminished German army which attacked. The battle of France had been lost for a number of factors, most of them accidental (several unlikely accidents together, at the same time, brought a catastrophe). So why did Germany lost World War Two? What was the fundamental cause? Because the French Republic attacked in a timely manner. The video is Roughly Correct. “Roughly Correct” is a category I will introduce. The caveat with the “Roughly Correct” is that the devil is in the details. So being Roughly Correct misses the diabolical, and thus the divine. Such Numbers Have To Be Taken With A Grain Of Salt. They Are Minima. An example of the perversion of reality by the “Roughly Correct” is that the aforesaid video slickly affirms, authoritatively, that USA’s bombings in World War Two were targeted against enemy cities (“contrarily to what you heard“). This is roughly correct. Roughly, but not really. What the video does not say is that a lot of industry was located in said cities. Bombing the industry meant bombing the cities. In particular, in the case of Japan, countless small factories were located throughout Tokyo, so the fire bombing there was not just a terror bombing, but, first of all, a strategic bombing to destroy the enemy’s industry. In the case of Nagasaki, the primary objective, with important military industries and naval installations, was under clouds so the Plutonium carrying B29 bomber diverted to Nagasaki (I don’t think that landing back with the Bomb had been envisioned). City bombing was started by the Nazis, on a massive scale, They started with the bombing of Guernica in 1936, to terrorize the population, which supported the legitimate, Republican government. Then, starting on September 1, 1939, the Nazis bombed Poland, To kill Poles, mills were deliberately targeted. Bombing French cities was next. It brought the French to retaliate with a successful Berlin bombing, to the Nazis’ hysterical fury (they screamed that the bombing of Berlin by the French Navy air force was a war crime). The Nazis were not smart, so they tried the same trick in England, especially in Coventry and London. 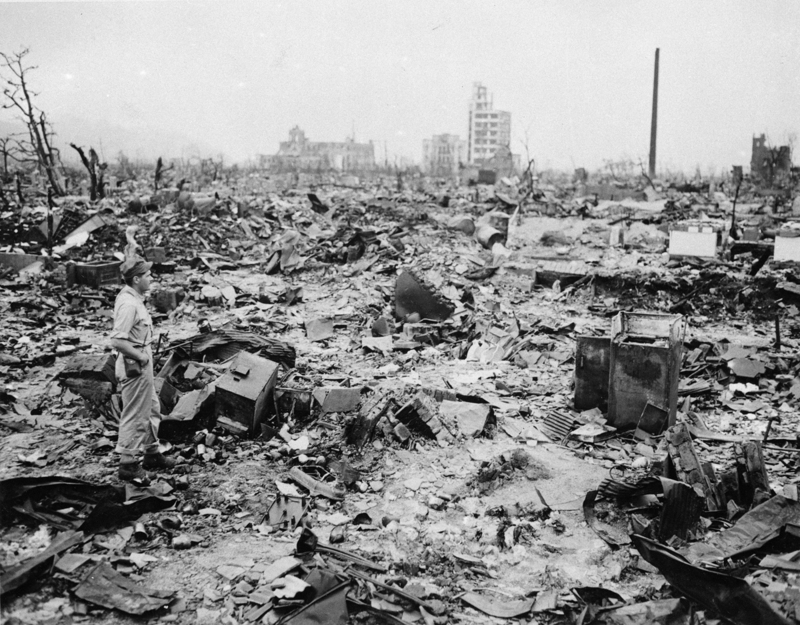 Those racist imbeciles were not even ready to wage a city-destroying war. They were too dim witted to have heard of the massive built-up of a long range British bomber force. British retaliations were terrible. Massive bombing of German cities by the RAF forced the Nazis to relocate industry in the woods. The Americans came later, and, to their credit, tried precise daylight bombing on specific factories, suffering losses which became sustainable only when the bombers could be accompanied by long range fighters). However, if anything, the video underestimates of the sheer numbers (a drunk Stalin famously joked to Churchill that he killed more Soviets than Hitler did). A number of countries had interest to undercount how many died. For example Russia wanted to look stronger, after the war, than it really was. The Nazis and the Soviets, together, killed at least 51 million citizens of the USSR (latest evaluations). The losses in Greece are above 800,000 (including more than 30,000 military). This informs the present crisis in Greece (whatever present German leaders say). The losses in Poland are around 6 million dead. Indonesia suffered up to four million dead (mostly civilian). From the Japanese invasion (something Japanese kids should learn). So a graph found in the Huffington Post has the pernicious effect to make the unawares believe that only Russian, Nazis, Americans and Brits suffered. In truth, in many places, the ravages of the war were so immense that counting the dead is impossible by up to a factor of five. Another point: distinguishing between “Nazis” and Germans is a distinction without a difference. However it exculpates most Germans living at the time from having collaborated with the Nazi machine. They did not have to. They were cowards to support the cruelty, debasement, violence and viciousness of the Nazi enterprise. Worse: most of Germans living at the time, above 95%, enthusiastically supported the Nazi project. This was amply demonstrated by the fanatical resistance of the Nazi population at the end of the World War, in 1945. What was called the “War of the Cities”. The Nazis had lost their right to exist, thus never had their killing frenzy been so high. And it was not just top-down. An example: Heinrich Himmler, chief of the SS, negotiated with the Swedish ambassador, and enacted, saving the lives of thousands of Jews. Himmler was anxious to save his skin (whereas, the top Brits, who captured him, were anxious to silence him: Himmler’s alleged suicide made little sense). Meanwhile, millions of Germans, aka, Nazis, were fighting to death. Just a little example: the First French army crossed the Rhine under fire, and then dashed through Southern Germany: Bade Wurtenberg, and then Bavaria, Austria. In Bavaria alone the French First army during what should have been a cakewalk in April 1945, suffered more than 5,000 soldiers killed. Meanwhile, as the Soviets, led by Marshall Joukov, triumphed at Berlin, they were left with only one hundred functioning tanks (out of the thousands Joukov’s tank armies had a few weeks earlier). So yes, the Nazis resisted, down to the bitter end, like the demented maniacs they were, and, even at the very end, they were an enormous percentage of the German population. Conclusion: Politically correct, and roughly correct is not philosophically correct: Germans were Nazis in World War Two. That is why Naziland was so hard to crush. Nazism was not a handful of criminals barking out orders. It was more than 70 million maniacs trying to goose-step all over the world. And the Japanese, who suffered around two million dead, of which much less than a million were civilian, should stop whining hypocritically: they killed more enemies by a factor of ten, or twenty. And more than 95% of those “enemies” were civilians. It’s high time for schoolbooks in Japan to depict those facts. The video wonders about the “long peace” which followed World War Two. Its cause is very simple: the world, since 1945 is administered as an empire with five principals, the five nuclear armed permanent members of the United Nations Security Council. None of these five powers had interest to attack and conquer (this may be changing as Xi and Putin are unstable leaders). Any factor endangering that nuclear oligarchy threatens the long peace (so Putin and Xi are threats). And when it breaks, watch out. Losses comparable to World War Two would kill now 250 million people, and potentially much more (as an Indo-Pakistani nuclear war would quickly demonstrate). So SCNF, the French National Railways, will pay American lawyers 60 million Dollars, because French railways were used to transport people against their will during World War Two. That has got to mean the French living today are culprit of something, and should pay American greedsters (mostly based in New York City, as usual). In other American news, sheep, condemned for having kept the Nazis warm in World War Two, agreed to compensate Jewish rackets with 60 million sheep skins. Holocaust Train Loading. Contemplate the Many Armed German Nazis. American Holocaust connoisseurs are a funny sort. They are all indignant about messy details, generally about the French, so that, being so busy in an irrelevant manner, they can forget the big picture. While the French Republic declared war to Hitler in 1939 (long time coming), the USA, as a society and polity, supported Hitler’s regime. Without that American support the Nazi regime would have collapsed in a matter of weeks (the topmost German generals said). That ambiguous, but crucial, American support is exactly why the Nazis thought they had a chance to win against France and Britain. How come none of this is of any interest to American Jews? Too hot to handle? But I can assure you that when France declared war to Hitler in 1939, Hitler was much hotter to handle. Had the USA supported the Jews, few of them would have died. But, because the USA did not support the Jews, the Nazis interpreted this lack of support of the Jews as an expression of support of Nazi policies. Very strong American anti-Judaism, and financing by Jew haters (such as Henry Ford, who gave $50,000 personally to Hitler, each year, a considerable sum at the time, among other things), certainly allowed Nazism to get to power (Browning was sending Nazis weapons using the American owned Hamburg-Amerika Line, Schacht held the German financial system, and was a pawn of JP Morgan, the GM CEO was fanatically pro-Nazi, etc., etc.). Worse: the USA propaganda machine, and its government suppressed the reality of the Jewish Holocaust. The Polish government in exile announced, as early as fall 1941, that 700,000 Jews had already been assassinated by the Nazis, in Poland alone. Although the BBC, New York Times and the Boston Globe reported the news (anticipated, and then confirmed by the French government in exile), the government of the USA ignored them. That was deliberate: the breaking of Nazi and SS codes by British Intelligence and the Office of Strategic Studies of the USA revealed, by summer 1941, dozens of mass assassinations of Jews and Communists. So why don’t American Jews sue the American government for, say, 6,000 billion dollars? It is not that the SNCF had a choice: the French Republic had been defeated on the battlefield in 1940. Hundreds of thousands of French soldiers and civilians had been killed (scaling up to millions relative to the present population of the USA, as France had only 40 million people then, and the USA has 320 million, now). Wikipedia again: “Following the 1940 Armistice and until August 1944, SNCF was requisitioned for the transport of German armed forces and armaments. The invading German troops were responsible for the destruction of nearly 350 French railway bridges and tunnels. According to differing estimates, SNCF surrendered between 125,000-213,000 wagons and 1,000-2,000 locomotives. Another strange day of censorships. Thursday the New York Times censored one of my comments, “With Democrats Like that, Who Needs Republicans?”, but allowed another. That is really the truth they don’t want to be known: there has been Republican leadership all along, under the supposedly “Democratic” administration. “You have indeed quite a few religious enthusiasts among your commenters, so I understand your quandary. I would gladly remove chunks of reality to let the comment go through, but at this point I really don’t see where to start (that is, which chunks to remove to qualify for atheism light… hmm, publication). I am also preparing a blunter, more robust, and more detailed version for my own site, and I don’t have infinite amounts of time. I concentrate mostly on the extermination of the Cathars, down to the last “Perfect”, and the last book. To avoid too much of a shock to Christians, in this next essay of mine, I will NOT expose the deliberate mass cannibalism (on children!) of some of the Crusades. Not this time. This, by the way, is very well documented by direct eyewitnesses (Joinville, etc.). If Christians have been horrific, that’s their business. If we cannot expose it, that’s our complicity. I don’t know if god(s) exist, or not, so I will not bother to define myself as an atheist. But I do know some elements of incontrovertible historical reality. As we explore reality further, it is not surprising that it will be found more harsh and offensive than Sade or Nietzsche have found it. Philosophers are offenders. Telling me I am harsher and more offensive than Sade, or Nietzsche, simply means that I fulfilled a qualification for my job. Yes, it’s all very obscene. But what is more obscene than Jesus’ cross? Saint Dominic and Calvin burning alive non-believers, close and personal? New wisdom, if really new, will always roll-over old wisdom: Literally, physically, brains have to be re-arranged. That’s a lot of work, and even pain. A crucifixion of the soul, or, at least, of neuronal networks. It’s easier to censor to re-hash the old philosophies, shun the new ones, and identify new wisdom to the incredible hulk, unlikely and repulsive. Easier, but not wiser. And what of the silly payments to so-called “survivors”? My family saved more than 100 Jews, to great fright, stress and effort, then barely survived an enraged Gestapo’s wrath, and pursuit. My family did not get a dime. Not to say that I am complaining about the trials, and lawsuits in the name of “Holocaust Survivors”: they force people to look at the past in a more critical way, and one step that way, is better than none at all. Besides, my family qualifies as “Holocaust Survivor” (saving more than 100 Jews definitively qualified a family for the death chambers). But the SNCF culprit of operating trains with a gun pointing at its head? Give me a break! Primitive anti-French racism. The proof? The French haters forgot to sue the Deutsche Bundesbahn (the new name of the Nazi Deutsche Reichsbahn, which deported tens of millions of People). The U.S. Congress sues the French for Nazism, not the Nazis! The Holocaust Rail Justice Act mentions by name the French, but not the Germans: to create the mood that Nazism was a French invention? If you ask the average American endowed with a bit of education, she will tell you Nazism was caused by “Versailles“, a French city. Nazism is all about France: did not Keynes say so? 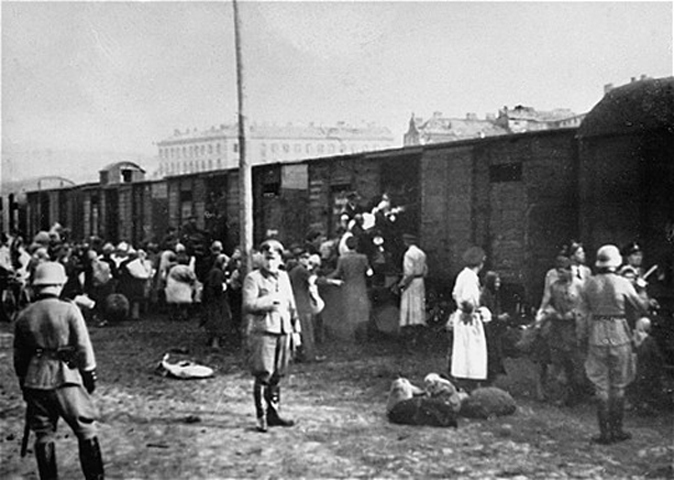 In a supreme effrontery, the legislation of the USA even accused the SNCF to have deported French resistance fighters. Never mind that some of the French train conductors accused by the USA were certainly themselves in the Resistance. “Only” 77,000 Jews were deported from France and assassinated by the Nazis, most of those were stateless refugees (stuck in France, because the USA refused to admit them!) So most French Jews escaped assassination, thanks to a lot of heroic resistance acts; by comparison, nearly all Dutch Jews were assassinated. The Nazis also deported and assassinated hundreds of thousands of French citizens, and now American politicians have drafted legislation to punish the French for letting the Nazis kill…the French. What for? Maybe to find a scapegoat for the Nazi temporary victory of 1940. After all, Hitler’s prime collaborator was the USA itself (even more than Stalin). Hence the vital interest of the powers that be, to divert attention, by accusing an innocent third party, and victim, France. Time for a Holocaust Truth Act. WHERE ANTI AMERICANISM COMES FROM? DEBT TO THE LORD DOES NOT MAKE SERFS GRACIOUS. ESPECIALLY IF THE LORD SET THE FIRE. Paul Krugman noticed that World War Two "left America with a big debt — bigger, relative to our resources, than we’re likely to face when the economic rescue is over. We dealt with it." Why? Krugman does not say. He is simply happy to assert that "big defense spending during the war didn’t somehow make it easier to pay down debt after the war was over." Krugman’s inner certainty made it somehow easier for me to show that, au contraire, defense spending during the war allowed the USA to purchase the world while it was on sale. No wonder the investment or, in other words, the debt of World War Two, was worth it. The devil is in what was the debt for, and who it was supposed to be paid back to. That the US government paid US defense contractors with borrowed money it got from US taxpayers was a sort of symbolic calculus during WWII. Relative to these internal intricacies, the result of WWII, that the USA came into political and economic and financial possession of the entire planet, is such an enormous fact that everything else pales in insignificance. The intricacies of the accounting of who should get most of the pie inside the USA is irrelevant. There was enough pie to give all American indigestion. Whereas, when Britain had to borrow to the USA to buy US warships (one hundred destroyers early in the war, for example), and other military supplies and services, it was a transfer of sovereignty; the USA took control of part of the economic destiny of Britain. That later sort of debt, from one country to another, can be ruinous, and not just economically. For example, what brought Argentina down during the twentieth century was not so much debt itself as the fact that it was owed to foreigners. When the foreigners got cold feet the peso collapsed, boosting interest rates even higher. To some extend this is happening to the USA now, because a lot of US debt is owed to foreigners, although this is still mitigated because the US dollar is still the world’s reserve currency ( but a wasting asset, to use military semantics). Right now the USA is still hell bent on a policy of using much force to get energy from the Middle East, rather than using much more effort to modify its energy needs. This policy creates another form of dependency on foreign powers, which is just as dangerous as debt owed to foreigners. The habit of gambling twice more to compensate for failed policies (for example invading Iraq, an ally, because one lost Iran, an ex-ally) makes this policy increasingly onerous and unstable. Now Iraq’s Shiite, an independent part of Iran, come to think of it historically speaking, is ready to cut a deal with Iran, as soon as there will be fewer US troops around, so how much more the USA will have to get in debt for to try to prevent this ineluctable evolution? Good debt and good taxes would mean, now, to set the country on a path to solve the energy crisis. The later the USA commits to this, the greater the pain. And this pain will probably not be restricted to the USA. One can compare the contemporary Louis XV style approach of the USA (”Apres moi le deluge” -After me the flood) to the contemporary French approach, which is exactly the opposite: gasoline is three times more expensive in France, and France will be introducing a carbon tax in 2010. This heavy taxation makes the French economy more efficient, hence it got out of recession faster. France has learned the history taught by an arrogant fool such as Louis XV, and has decided to do exactly what that idiotic monarch decided not to do: have foresight, and act on it. French students are forced to study history at school for ten years: history is not an elective, and it is rammed into the minds of children as soon as they can read, and again, and again, as they become more intelligent. Thus, the approach to policy of Louis XV is well known to French students. Since this time a literal flood is coming, it’s even easier. While Voltaire advised Louis XV not to die for a few acres of snow in Canada, Colonel Washington speculated for real estate in the Ohio valley, gun in hand, determined to extend his dominion. Since then Washington, the city, has been best at wasting the opposition and extending dominion. But it was against weak opposition, and with tremendously strong allies. German forces late in 1918 were not what they were in August 1914, they were beaten. In 1944-45, the maximum of 64 American divisions engaged in Europe constituted a minority, even on the Western front. In the East, Stalin had 600 divisions (and 26.6 million dead). The French army was one million. When attacked by elite Nazi forces during the Battle of the Bulge, it was ordered to evacuate Alsace by Eisenhower. But the French army refused tor surrender one inch of ground . A frustrated Ike later cut off fuel and ammo to the French. Still, they got to Austria first. The British army was nearly three million. The study of history shows that nothing replaces the correct policy, early on. The tragedy of the USA is that its successful history is that of expansion and using force onto others, unabashedly, to maximize profit. This sounds arcane, but transpose this wisdom to the health care battle, and you have got Dr. Ezekiel Emanuel. And the worst is that wisdom of profit violence worked, and could not have failed to work. Considering the initial conditions of the USA. Now, all great empires were built by force, right. But, in the case of the USA, a single method to solve all problems was thus established, during the last four centuries, and it has become most of the history most Americans will ever know. Hubris became how the West was won. It worked. But now it’s failing, and most Americans do not have the eyes in their heads to see it is. Europeans have learned though, that to draw such a lesson from history, that hubris is your friend, is a mistake, and a most common one. More humility, prudence, knowledge, appreciation and more foresight are to be preferred. Not all taxes, and not all debt are bad. More crucial is what the taxes and investments are for. If they are for progress, they are good. If they are for bankers’ bonuses, they are bad. Krugman, although going in a well deserved vacation, came back to the charge: he said that commenters objected that "didn’t the fact that the rest of the world was in ruins help? Krugman does not think so; “Let me explain why [the] objection [is] off point… the war left our competitors in ruins? Well, yes it did — but it also left our markets in ruins. This goes back to stuff I wrote way back, about the fallacy of thinking about a country as if it were a company; basically, there’s no reason to believe that economic growth in the rest of the world necessarily makes us poorer." Nor, would I perfidiously add, is there any reason to believe that economic growth in the rest of the world necessarily makes us richer. Let me make an African observation: when the lion is weak, even dogs can eat it. The weakening, and then destruction of the lion is profitable, although it goes to the dogs. Before going back to some carpet bombing of mine with facts of WWII, let me make a very refined observation that is little known and that any serious economic theory will have to take into account. The Fourteenth century saw several (related) calamities in a few years, including famines, ecological collapse, severe climate cooling, the start of the 478 years "100 years" civil war between Paris and London, Normandy and Anjou, plus the "plague". Whatever the "plague" really was, it killed about half of Europe. People were left twice richer. Hence an economic boom. So much for the more, the merrier. Contrarily to what Krugman implies, the ruinous aspects of the competitors’ markets was an enormous advantage for the USA, after WWII. European lions laid in ruins, while American dogs had full stomachs. No explanation really necessary. The USA was left with huge profits, in part just as Goldman Sachs, having reduced its competition, thanks to the US government, is making larger profits than ever. Let me go into World War Two specifics. Did the US markets disappear at the end of WWII? No. Just the opposite. One has to distinguish having a destitute patron, and having no patron. Actually, yesterday’s lord, if destitute, can be made into a dependent. WWII expanded US market enormously. Let me explain. For example, when the French decided to build a nuclear power industry, they bought the technology from Westinghouse, a US company. Since they built many nuclear plants, it was a major deal, which transferred back a lot of wealth to the USA. Let’s dig a bit deeper in that example. The French physicist (and Nobel prize winner) Irene Curie discovered the principle of the nuclear chain reaction (generally misattributed in "Germanic" countries to other people who contributed later). Patents on nuclear energy were deposited as early as 1937. When the Curies alerted the War Minister to the military application, making bombs, the patents were withdrawn, and a military program started. 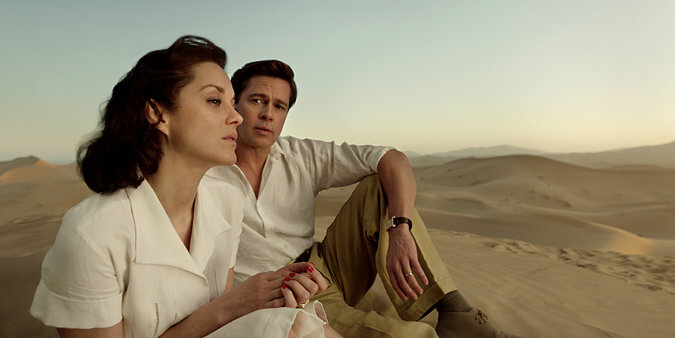 After adventures that put James Bond to shame, the program went on as the Manhattan project. The economic point is this: the French were way ahead in nuclear energy. Still because of WWII, they were forced to buy massively US technology 30 years later. The same holds for jets. The first jets were Europeans, just as the first helicopters were French (so was the first plane). The Germans were way ahead with jet aircraft: the swept wing Me 262 was 5 years ahead of US technology (even though the Americans could study captured Me 262s). Still, Germany became dependent upon American jets, for decades. It is only now that, thanks to EADS (including Airbus) and Arianespace that Germany has become independent again in aerospace. EADS is now the world’s largest aerospace-defense company (in sales). Sweet for the first country to sink a battleship using a cruise missile, or to use rocket interceptors (Heinkel 163). By the way the fancy electronic in that drone which sank that big ship came as no surprise; (basically) German scientists invented the first transistors, as early as 1925 (the American "discovery" of the transistors was more than 20 years later and was proven, scholarly, and judicially, to be a copy of the German germanium transistors and their patents). Another German sweet vengeance was that 100 Nazi rocket engineers were working on Von Braun’s Apollo moon landings. And so on. None of the huge transfers of American goods and technology would have happened, in the aftermath of WWII, but for WWII. BTW, the captive markets that were the Portuguese, Spanish, Dutch, French and British empires, plus the Commonwealth, French Algeria, and enormous Franco-British protectorates over the entire Middle East, could basically leave the USA without markets. Pakistan would not have become a Muslim fundamentalist American puppet/client, if not for the collapse of the Raj. Actually, there would have been no Pakistan. A mighty Great Britain would have kept Gandhi’s Hindu nationalism under control, and thus the Muslim reaction. After WWII, the USA acquired the entire planet as a market, except for the USSR. The patrons were desperately poor, but they were extended credit by Uncle Sam. Then they became dependent upon Uncle Sam, exactly, and in all ways, as serfs became dependent upon their Lord in the Middle Ages. This is where the "Anti-Americanism" Obama does not understand at all, comes from, deep down. All of this was made possible by the crafty refusal of the Roosevelt administration to help the French republic as she set herself the mission of destroying Hitler. Instead countless US plutocrats transferred technology and directly invested in Hitler’s Reich. in 1939, France found herself at war formally with Hitler and Stalin, both helped, managed and financed by many of Uncle Sam’s plutocrats. Often when I write this, the next thing which happens is that I get banned from"left" websites, who seem to all too often be all too friendly to plutocrats. Although the history I mention is all easy to prove (however, I know of no book putting it all together). But, of course, many Internet commenters, in the USA, find culturally refined to object to “conspiracy theories”. Little do they know that most of history’s tragedies were the result of conspiracies. On my sites, I studied in depth if that crime was committed with foresight or not, and its extent. Nuremberg established that some of the Nazis had conspired to make a war of aggression. They were hanged. My question is whether the conspiracy was much greater. And the answer is yes. In any case, the "American Century" was made possible by WWII. The effect was to make the world the captive market of the USA, fed by US credit. As WWII fades away, so does the "American Century". Resistance is futile.